A recipe for Baked Custard made with simple ingredients of milk, eggs, vanilla, and sugar. It is a creamy and silky dessert for two that is easy to make. Preheat oven to 350 degrees F. Place two 10-ounce ramekins in an 8- or 9-inch square baking dish. Heat the milk in a saucepan over medium heat until it barely reaches a simmer. While the milk is heating, whisk together eggs, sugar, vanilla, salt, and a dash of nutmeg. Very gradually add heated milk whisking constantly while adding. Do not pour in all the milk at once or it will cook/scramble the eggs. Divide the mixture equally in the ramekins. If foamy on top, use a spoon to skim off the foam. Lightly sprinkle tops with nutmeg. Pour hot water into the baking dish to a depth of 1 inch. 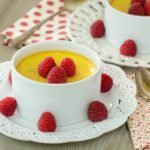 Remove custard cups from water and cool to room temperature. Once cooled, refrigerate to chill thoroughly. Time stated does not include cooling and chilling.